"Convert SEGA Genesis ROMs for easier playback on an emulator." 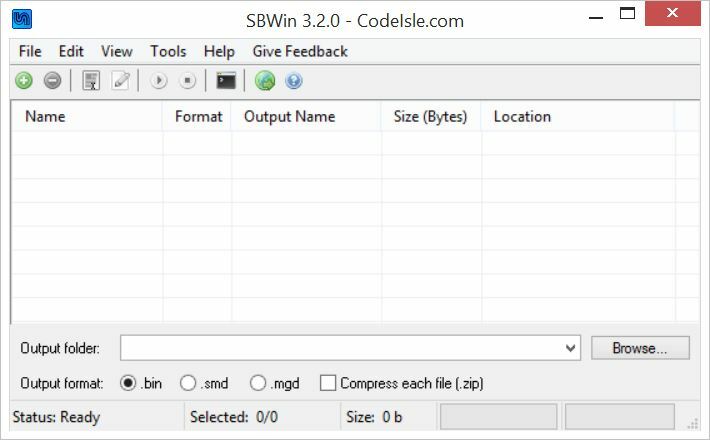 SBWin Converter, formerly known for its longer name SMD BIN WIN, is a ROM converter that specializes in converting SEGA Genesis ROMs for Windows PCs. With this application you will be able to convert SEGA Genesis ROMs to one of three different formats that can be used in supported SEGA Genesis emulators so that you can get back to playing your favorite games that, like me, you probably grew up playing. You can finally get back all of the joy and headaches of the original Sonic game by converting the ROM into a format that your emulator can read and works best with. SBWin is an acronym for the application’s original name – which was filled with acronyms for the supported converted file formats (Super Magic Drive and Binary). We can just assume what the WIN stands for. Although there is no MD or MGD (Multi Game Doctor) acronym included in the new or old name of the application, the support is there and it works just as well as the other formats. The application also supports the compression of converted files, this means that you can always compress each file into .zip format for smaller files and making them easier to transfer between multiple Windows PCs on the go. The interface of SBWin is very simple, but it is exactly how it should be. There are no unnecessary buttons or menus. Each button within the interface has its own unique ability and use. During almost every conversion process, you will find yourself using almost every button that has been offered to you. The large information window in the application allows you to see important information about the current loaded ROMs. The interface allows you to see the name of the SEGA Genesis file, the format, the output name, the file’s size, and location on your disk. You can use the built in logger interface, accessible in the “View” menu of the application. Opening up the logger will allow you to see what’s happening under the hood. If you’re concerned with how long it would take to convert all of your SEGA Genesis ROMs to another file format, don’t be. The developer advertises that blazing fast conversion speeds are a part of thins application. With fast conversion speeds, you can convert more ROMs in less time than it would take for you to use an alternative application for SEGA Genesis ROMS. Maybe one of the best parts of this application is the fact that it is available to everyone. Anyone can use this application as long as they’re using a Windows PC between Windows XP and Windows 7. Unfortunately this does also include Windows Vista, but hopefully no else is still using Vista as their daily driver – if you are, I can think of a few other programs that you should download before you download any games. The developer does not charge a premium to use the application as SBWin Converter is a completely free download for everyone to use, whenever, and wherever!